The pure detox entry I did yesterday reminded me of another pampering me and my sister got at the Hilton Hotel couple of months ago. Thanks to Ate Amy, I got a couple of passes for The Spa's Aquamedic pool which is sublime IMHO. Aside from the use of the pool, we're also able to use the Moroccan bath, the steam and the sauna. It's my sister's first time to experience all that so it's a wonder seeing old routines through new eyes again. August was still Ramadan time that is why after our Aquamedic pool session, the parentals are waiting for us at the Ramadan tent of the Hilton. The tent is 4 times bigger than our house in the Philippines! During Ramadan, people normally break their fast by eating laban milk and dates. Really long stick bread is yummy! The tent have different food stations. From traditional shawarma, grilled kebabs to different kinds of pastas. My plate is a mishmash of everything and anything! One of our favorite every time we eat at Hilton is their dessert station. It's where you can find layers upon layers of heavenly goodness! My dessert plate. Gazillion worth of yummy calories. I've said it before and I'm posting it here now, Ramadan for some reason invokes the hunger within that people eats more than normal. It's very true but lame enough reason as my excuse for overeating during the Ramadan season! LOL! Who wouldn't feel safe with this guy watching over you? I know... I know it's not until next week but heck it's so fun celebrating it everyday this month. I seriously love this holiday. but a rejuvenating bath soak. and instructed me to drink 3 small bottles of water before submerging myself into Wasabi bliss. on a glorious weekend morning by the park. The detox should be done 3 times in 3 consecutive days for it to be effective. On those days & week following that, expect a lot of toilet trips. My mom and my aunt are smokers. Not only are they smokers, they are very picky on what they smoke! Most of the time, the cigarette that they would only puff is not available here in Kuwait making their friends and family import it from Thailand. In hoping that the people I know would be as disgusted & scared enough to stop smoking, I posted this on Facebook and tagged all the smokers in my friends list. I should've known better. My mom and my aunt solves that hard reality & yucky problem by covering the photo with ink so they can smoke in peace. Beside Christmas, Halloween is my second favorite holiday! This year, with a little prodding with the old people, I finally got the go signal to decorate our house. Which better place to get decorations but in Party Land! So after work, I asked my driver to take me to the biggest Party Land branch which is in Shuwaikh. Their window display is so eerie & cool at the same time! The store is full of wicked designs that will amaze, startle and will make you scream like a little girl. and costumes too! All kind of paraphernalies you could think of is there. The very same weekend after I went, I dragged the family + a dozen extended ones back there for costumes & more Halloween decorations. On the 20th of August, I have enjoyed an enchanting dinner along the Dubai Creek under the starlit sky on board the unique Bateaux. That unforgettable luxury cruise experience served us sumptuous four course gourmet meal. Seafood en Papillote for the main course! Except for the drinks. Don't order their Long Island. You'll gag. Aside from that the whole night was fun with non stop talking and loads of laughter. We hardly felt the boat move true to its Bateau form. It's really way up there compared to the other dhow cruises. From Bateaux's glass enclosed interior, we saw the landmarks and historic sights along the Dubai Creek. It was a wonderful dreamy night and I wish this experience to every girl out there. Arrived and stayed at Golden Sands for their awesome Ramadan price. haha! It's a studio apartment. I love staying with friends but I don't want to impose much so I almost always want to stay in a hotel. Golden Sands is a hotel apartment that literally gives more value for our money. More on the price we got sold on the free wi-fi! boohooo to other establishments that asks for internet pay. When looking for a place to stay during vacations one of my ultimate requirement is sparky white bed sheets. Anything darker than that is a no - no mainly because of hygienic reasons. 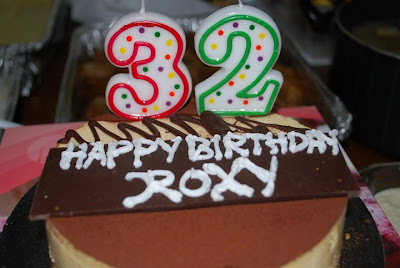 Cake for the absentee celebrant! House party for the win! Since it was Ramadan, eating out during the day is next to impossible but was not a problem because hey who wakes up before lunch while on vacation anyways? To accommodate our appetites we hoard the nearest Spinney's that we can cook back in our studio! Nom! I salivate just looking at the photos. I wish we have it here in Kuwait =| I gained 2 kilos because of these in the span of 8 days! Better than any breakfast buffet in town! Yum! I'm getting hungry by blogging about this now.